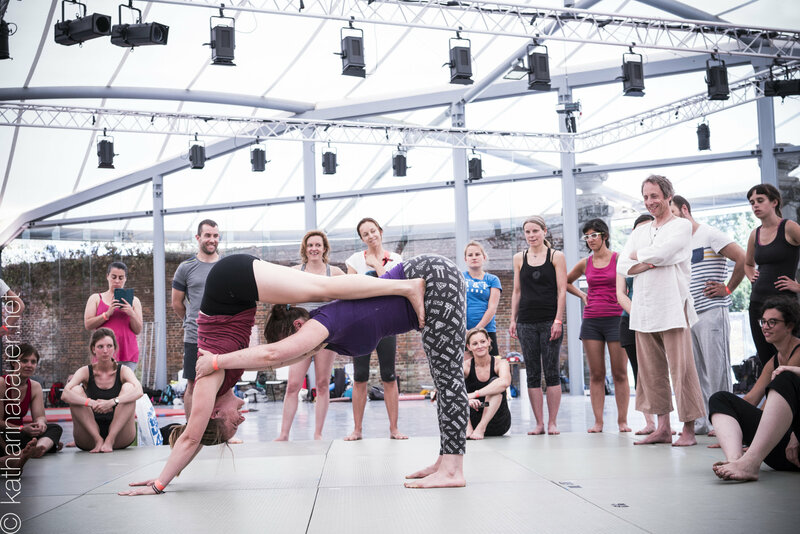 The festival is for Acroyogis and practitioners who have been practicing for at least 6 months. We recommend that you take at least 10-15 AcroYoga classes before attending the festival. There will NOT be any workshops for absolute beginners. Level 1: You are a beginner but you have already tried acroyoga (some classes and experience). Level 2: You can do the AcroYoga sun salutation (Bird-Throne-Chair-High Flying Whale-handstand out), cartwheel, star stable min 20 sec, shoulder stand stable min 20 sec, tuck sit 5 sec. You can hold these poses confidently and move between them comfortably. Level 4 : You are comfortable and stable in many more challenging positions in L-basing (long arms foot to hand, hand to hand, foot to foot, mono limb,…). You are able to go through complex long transitions, including jumps, pops, dynamic movement, free balancing…. We will also have workshops for standing acrobatics. Level 0: You never tried standing acrobatics and would love to try. Level 2 : You are working on high shoulderstand, high bird and high side star. Level 3 : You can do high shoulderstand, high bird and high side star and you are working on high hand to hand and foot to hand (spotter helping with the entry is fine).